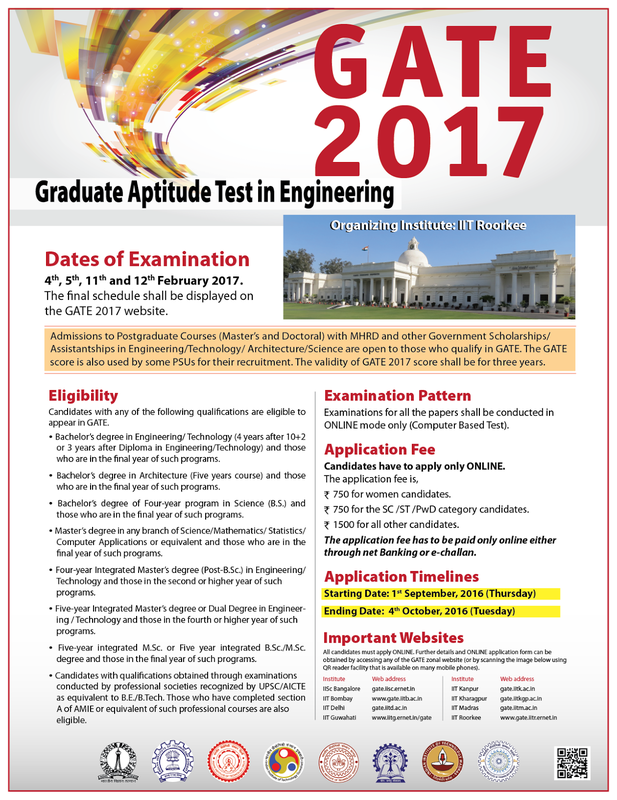 GATE 2017-GRADUATE APTITUDE TEST IN ENGINEERING. 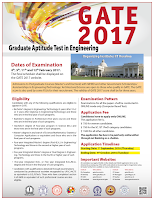 indian Institute of Technology (IIT), Roorkee, has announced Graduate Aptitude Test in Engineering (GATE 2017) for admission to Postgraduate Courses (Master's and Doctoral) with MHRD and other Government Scholarships/Assistantships in Engineering/ Technology/ Architecture/ Science. The GATE score is also used by some PSUs for their recruitment. GATE 2017 score shall be valid for a period of THREE YEARS ONLY from the date of announcement of results. The GATE 2017 examination shall be held for international candidates in Bangladesh, Nepal, Sri Lanka, Ethiopia and United Arab Emirates (U.A.E). The XE paper now has a new section on Atmospheric and Oceanic Sciences (section H). So, with this the number of sections in the XE paper has increased to eight (A-H). Bachelor’s degree in Engineering/ Technology (4 years after 10+2 or 3 years after Diploma in Engineering/Technology) and those who are in the final year of such programs. Master’s degree in any branch of Science/ Mathematics/ Statistics/ Computer Applications or equivalent and those who are in the final year of such programs. Five-year Integrated Master’s degree or Dual Degree in Engineering/ Technology and those in the fourth or higher year of such programs. Five-year integrated M.Sc. or Five year integrated B.Sc. / M.Sc. degree and those in the final year of such programs. Admissions to Postgraduate Courses (Master’s and Doctoral) with MHRD and other Government Scholarships/ Assistantships in Engineering/Technology/Architecture/Science are open to those who qualify in GATE. The GATE score is also used by some PSUs for their recruitment. Examinations for all the papers will be conducted as Computer Based Tests only. The validity of GATE 2017 score shall be for three years. This year GATE 2017 shall hold examinations for candidates in other countries such as, Bangladesh, Ethiopia, Nepal, Singapore, Sri Lanka, and United Arab Emirates (UAE). The application fee can be paid only either through net-banking or e-challan. GATE 2017 Online Examination Dates: 4th, 5th, 11th & 12th February, 2017 (On Saturdays and Sundays only). o Bachelor’s degree in Engineering/Technology (4 years after 10+2 or 3 years after Diploma in Engineering/ Technology) and those who are in the final year of such programs. o Bachelor’s degree in Architecture (Five years course) and those who are in the final year such programs. o Bachelor’s degree of Four-year program in Science (B.S.) and those who are in the final year of such program. o Four-year integrated Master’s degree (Post-B.Sc.) in Engineering/Technology and those in the second or higher year of such program. o Five-year integrated Master’s degree or Dual Degree in Engineering/Technology and those in the fourth or higher year of such program. o Five-year integrated M.Sc. or Five year integrated B.Sc. /M.Sc. degree and those in the final year of such programs. B.E./B.Tech. Those who have completed section A of AMIE or equivalent of such professional courses are also eligible. Engineering or Master’s degree in Science in a relevant subject or are in the final year of the program. Dates of Examination: 4th, 5th, 11th and 12th February 2017 (On Saturdays and Sundays). Application Fee: The application fee is ` 750 for women candidates, ` 750 for SC/ST/PwD category candidates and ` 1500 for all other candidates. The application fee is US $50 for all candidates of International Examination Centers.